Organized, successful people know what they are doing and when. They don’t live every day like a mad person as circumstances and other people’s agendas dictate. Taking care of yourself seems to be a no-brainer, but it is THE most neglected thing we do and THE most important thing that we need to do. If we want to experience the change we are looking for, this can’t be ignored… especially when life throws us a curve or there are out-of-the-ordinary things going on. This is when self-care is most often tossed to the side. When the sh** hits the fan, self-care is, unfortunately, the first thing to be dropped, and it is exactly the time when we need to adhere to it the most. 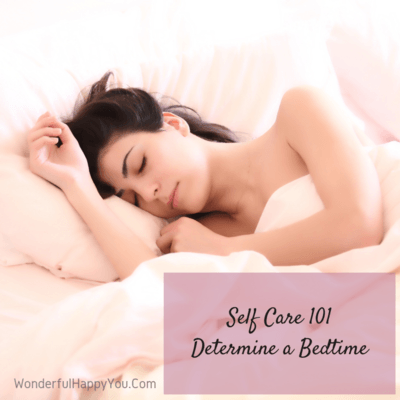 Your first self-care assignment (which will immediately make a huge impact on your life) that we are going to work on is determining a bedtime and being sure that we drink enough water every day. I know your nature and you are always taking care of other things and other people, and you put yourself on the back burner. We often feel that there is no time to take care of our needs, and we don’t see it as all that important….but it is vitally important to becoming organized and successful. Get yourself ready for bed every night and determine a bedtime. Think about what time that will be and then write it down, set it in stone, and let your family know. Consider that we need about 7 hours of sleep. Set a time with this in mind and don’t go to bed past 30 minutes of your set time. Don’t forget to tell your family, or those living with you that this is what you are doing. Let them know what time you will be retiring, and then YOU need to honor it by making it happen. We teach people how to treat us, so they’ll get it if you stay committed. If you are asked to do something for someone last minute, SAY NO! Let them know that you are respecting your new routine, and they will too. They will get the message that you mean business, and if they want something done they will learn that they had better ask you early enough. You can use the “Say No” habit* here when requests are made that would conflict with your new time to go to bed. Now, there is more to it than just getting to bed on time. You need a routine. Don’t begin to get yourself ready for bed just before you crash. I want you to begin seeing this new habit as a matter of importance and appointment. If all you do is set a routine to prepare for bed by washing up, putting on your pajamas, and getting to bed at your set bedtime, it will move your world a wonderful happy degree. The other part of this assignment is to be sure that you drink enough water during the day. Our bodies are over 70% water, it is so important to stay hydrated throughout the day to help us be our best. I go to sleep with a large glass of water by my bed and drink it first thing in the morning. Let me know how you’re doing with these assignments. This is not a one-way street, get yourself in the Facebook Group and connect with others who are on the same journey as you. If you are not part of this series and you don’t want to miss a post, CLICK HERE to sign up. I’m there for you Gina, open up the emails every day, practice what you learn and know that help has arrived. You have a lot on your plate and it can be a real God-send because we normally do what it takes to change when we’ve come to a place where we just can’t keep doing it the same old way anymore. Employing all that I am sending you will truly help you to find peace in your days, and if you enroll in my course when it becomes available on the 15th you will be so very very happy.